On their third album, the winter-themed "Our Season Draws Near", 1476 strips away the dense layers and production from past albums and delivers its most raw, intimate and urgent record to date. 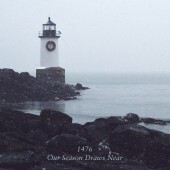 Far more guitar and drum-driven than anything the band has created before, "Our Season Draws Near" showcases 1476 at both maximum aggressiveness and its most delicate, using minimalism, space and the power of dynamics to create massive, heavy sound. Described as 'a small candle flame of life lost in the middle of a winter void,' the album delves into experiences with isolation and alienation and the idea that beneath the frozen surface is an internal fire and desire to defeat these obstacles. Produced by the band and mixed by Markus Siegenhort of post-black metal spearheads Lantlôs, "Our Season Draws Near" captures 1476 at its heaviest and most personal apex.